NO MORE appointments with your healthcare professional just because your calendar says so. Diabetes is managed everyday by your decisions. As a diabetic, you deserve to have professional support and help when you have challenges with your condition and you do not know how to deal with them. The support needs to by available anywhere, anytime - with you in your pocket. Appointments, if needed, should always be based on your need rather than standard care routine. You can get more than sufficient help online by sharing your data with your care team through Balansio. 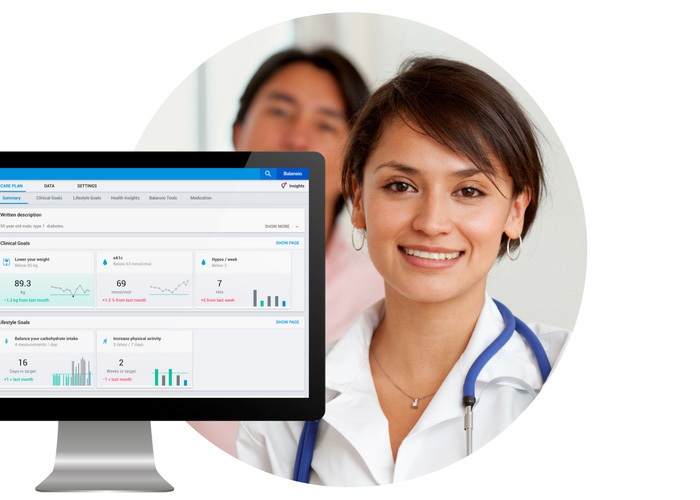 BALANSIO offers a completely new way of providing care and support for your patients, where the impact of care is no longer bound to face-to-face time in set appointments. With Balansio, interventions and changes to the medication and other care routines can be introduced one-by-one over time. Patients real need for care and support drives your focus on those who really need the help right now. BALANSIO brings the professional services of your diabetes clinic directly to your smartphone. Balansio is accelerated with automated clinical intelligence, which helps you to understand how your daily decisions and routines affect your diabetes management. With Balansio, you can learn to manage your diabetes better and to adjust your daily routines so that they enable better care balance. medical device for diabetes clinics and hospitals to extend their clinical services beyond appointments. Balansio contains other individual CE marked medical devices (e.g. Bolus Calculator). Quattro Folia has a full certified quality management system as per MDD, ISO 13485 and FDA requirements. Our team has been treating, living and working with diabetes for over 170 years altogether. We know how the ups and downs feel, what is needed to find the balance in diabetes management and how difficult it is to properly manage the diabetes care in the busy life of a diabetic or a clinician. Balansio has been developed based on the knowledge of our professional team, including our medical advisors, and diabetes-related research. We have already established clear results about which you can read more here. With Balansio care model there is a possibility to avoid over 60 % diabetes-related complications. Balansio Pro for your clinic! Thank you! We will get in touch with you within couple work days. and find your diabetes care provider! Balansio is a CE marked medical device.